The contents of Turtle Walk – the Taos, New Mexico home of renowned fashion icon and art collector Millicent Rogers (Am., 1902-1953) – will be at the center of an auction planned for Feb. 22-23 by Charlton Hall Auctions in West Columbia, S.C.
Press Release (ePRNews.com) - West Columbia, S.C. - Feb 15, 2018 - The contents of Turtle Walk – the Taos, New Mexico home of renowned fashion icon and art collector Millicent Rogers (Am., 1902-1953) – will be at the center of an auction planned for February 22nd and 23rd by Charlton Hall Auctions, online and in the firm’s gallery at 7 Lexington Drive in West Columbia. Start time both days is 11 am Eastern. For those unable to attend the sale in person, online bidding will be provided by Invaluable.com. Mary Millicent Abigail Rogers was the granddaughter of Henry Huddleston Rogers, Sr., one of the original founding partners of Standard Oil, along with John D. Rockefeller, Sr. As heiress to her family’s vast wealth, Ms. Rogers was able to freely indulge her passions for travel, fashion, romance (she was married three times and had romances with Clark Gable, Ian Fleming and the Prince of Wales, among others) and, perhaps most important, Southwestern-style art and jewelry. While visiting Taos, New Mexico with friends, she was captivated by the beauty and culture of the American Indians. She bought a rundown 17th century house, renovated it, named it Turtle Walk and became a permanent resident of Taos. She immersed herself in the art, jewelry and culture of the Pueblo, Hopi, Navajo, Apache and Zuni tribes and incorporated Indian designs throughout the house. She also became a dedicated champion of Native American civil rights. Turtle Walk was filled with an eclectic array of Native American art and objects, decorative arts, furniture, fine art and fine appointments (and books) for the library. Also offered in the sale will be part of the estates of Arturo Peralta Ramos, Jr., Millicent’s son, and his wife, as well as property from the estate of Julia Brewster Ballard, the mother of the highly successful Ballard Design Company, objects from a Southern museum deaccession, and collections from 14 states. Native American art and objects will feature several spectacular Navajo pictorial weavings, to include a sand-painting example in the ‘Whirling Log’ design by either Hastiin Klah or Gladys Manuelito, circa 1925, 66 inches by 68 inches; a tightly-woven, serape-style Late Classic men’s wearing blanket, circa 1880, showing serrated devices and thunderbirds; and a Navajo Yeibichai weaving made circa 1930-1940, showing dancers in ceremonial attire, 38 inches by 58 inches. Also offered will be a photogravure titled Indians on Horseback by the renowned American West photographer Edward S. Curtis (1868-1952), signed and framed, 16 inches by 12 inches; 19th century Hopi painted cottonwood katsina dolls, including a Talavai doll, 15 ½ inches tall and one with a pale green case mask, black skirt and kilt, 13 ½ inches tall. Also up for bid will be a pair of fully-beaded late 19th century Sioux hide mocassins, sinew stitched and boasting velvet cuffs. The category will also feature a painting on hide attributed to Teddy Weahkee (Zuni, 1890-1965), titled Knife Wing God, circa 1920-1950, with vibrant design elements, 60 inches by 43 inches; a circa 1900 Apache pictorial basketry olla with horse, dog, cross and geometric designs in devil’s claw; and 19th century pipe tomahawks, including a Plains/Prairie tomahawk, richly patinated, 25 inches long, and a Plains tomahawk with diamond and sun design, 14 inches long. The original artwork will span the globe. Oil on canvas paintings by foreign artists will include Pensees et Dahlias Dans Une Vase by Henri Fantin-Latour (Fr., 1836-1904), artist signed and framed, 19 inches by 13 inches; Celebrating the New Arrival by the Flemish painter Jan Josef Horemans (1714-1792), artist signed and unframed, 18 ½ inches by 24 ½ inches; and Procession by Josep Maria Sert I Badia (Sp., 1874-1945), framed and unsigned, 12 inches by 27 ½ inches. Works by American artists will feature an oil on canvas painting by Oscar Edmund Berninghaus (N.M., 1874-1945), titled Bunk House, Taos, NM, artist signed and framed, 12 inches by 16 inches; an oil on canvas by Danish-American artist Emil Carlsen (1848-1932), titled Still Life of Roses in Vase, artist signed and framed, 22 inches by 16 inches; and a framed tempera on paper by Morris Graves (Wash., 1910-2001) simply titled Vase, unsigned, 48 ½ inches by 24 ½ inches. There are even artworks in the auction of and by Millicent Rogers. An early 20th century Portrait of Millicent Rogers, done in pastel and pencil and in a frame, 20 inches by 14 inches, is artist signed, but illegibly, so it’s unsure who rendered it. Meanwhile, an unsigned 15-inch-tall bronze bust with pewter patina that’s attributed to Ms. Rogers herself, of the writer (and former lover) Ian Fleming, he of James Bond fame, is on a slate pedestal and has a New York foundry mark. Decorative arts are plentiful and will feature George I Britannia silver salt cellars (James Rood, London, dated 1717), octagonal form, with a made-to-match set of four by Chrichton (Loindon, 1931); a circa 1829 rectangular Historical Arms of Delaware transferware platter by Thomas Mayer Stoke (Cliff Bank Works); an English (or French) armorial partial dinner service, circa 1800, 43 pieces in all; and a Dutch Delft blue and white charger, signed, from the 18th century. Fans of the Renaissance era will be treated to an Italian Renaissance polychrome stucco panel, done in the manner of da Maiano, of the Virgin with Child (probably Florence, 16th century); an early collection of wrought iron work that Ms. Rogers inherited from Henry Huddleston Rogers, including a set of four 17th or 18th century Renaissance-style wrought iron torcheres having a scrolling design with wide trefoil drip pans, 55 inches tall; and a pair of Renaissance Revival wrought-iron standing torcheres, possibly Samuel Yellin revolving candleholders, 67 inches tall. The Asian category will include a beautiful Cizhou ware meiping vase from northern China and made during the Song-Jin dynasty, with a slip-decorated foliate design, 17 inches tall; an early Chinese Qing dynasty bird of prey painting on silk, depicting a bird perched on a silk-draped rod, with brocade border, framed, 55 ½ inches by 31 inches; and an early Chinese pottery ox-drawn cart, probably Tang dynasty or later, with an ox standing foursquare, pulling a two-wheeled cart. Furniture will span several continents and centuries. From England, pieces include a William IV carved mahogany library table, circa 1835 (Ms. Rogers was photographed seated at this desk in the March 1945 issue of American Vogue); and a George III mahogany and later marble-top pier table (possibly Irish, circa 1770). Also sold will be a gorgeous northern European carved oak coffer, or marriage chest, made circa the mid-17th to early 18th century, with a molded edge top. 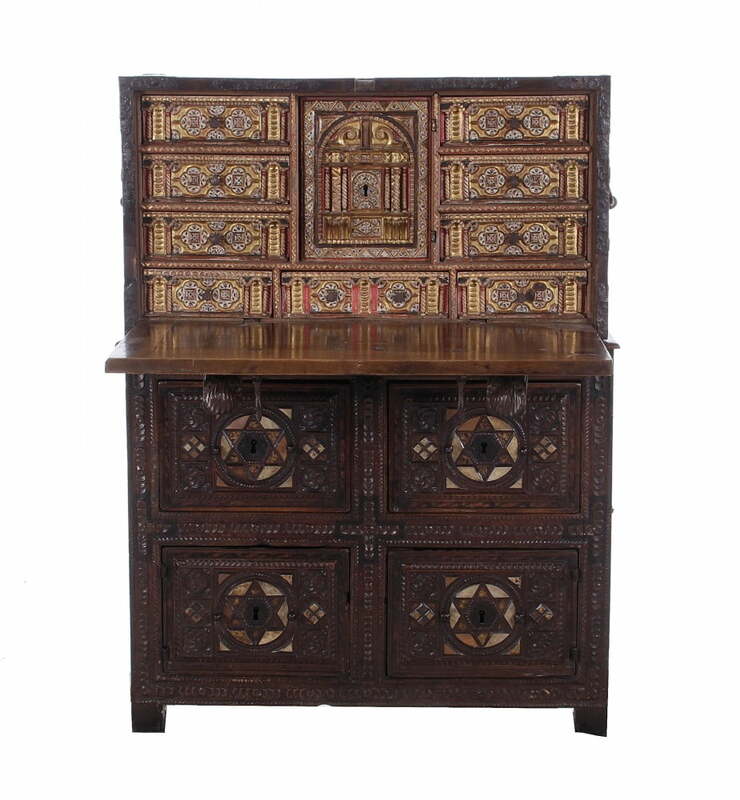 The star furniture lot from Spain is the Baroque iron-mounted walnut vargueno (a cabinet having drawers enclosed by a fall front) on stand, made in the 16th or 17th century, with embellishments, carved cartouches and panels, and more. From Italy, furniture will include two Baroque inlaid and carved 17th century walnut tables, one with single board top, frieze with drawer, turned legs and square feet; and another with a single plank top, a skirt with two drawers, all on bun feet. American furniture will feature a Federal maple highboy made in New Hampshire, third quarter 19th century, 72 inches tall, with molded crown and long graduated drawers top and bottom; and an American Classical carved mahogany worktable attributed to Joseph Barry (Philadelphia, circa 1820), heavily carved, with a hinged serpentine top. And from France will come a French Renaissance 17th century carved oak buffet a deux corps, having a molded crown dated 1689. • Bibliotheca Graeca, Johann Albert Fabricius, BIBLIOTHECA GRAECA, SIVE NOTITIA SCRIPTORUM VETERUM GRAECORUM. Hamburg: Christian Liebezeit & Theodor Christoph Felginer, 1712-1728. Original 14 volume set. • 1st edition copy, The Herball or Generall Historie of Plantes, Gerard, John (1545-1612). THE HERBALL OR GENERALL HISTORIE OF PLANTES: Gathered by John Gerard of London Master in Chirurgerie. Imprinted at London by John Norton, 1597. • Histoire Generale Des Voyages Prevost d’Exiles, Antoine-Francois abbe. HISTOIRE GENERALE DES VOYAGES, OU NOUVELLE COLLECTION DE TOUTES LES RELATIONS DE VOYAGES PAR MER ET PAR TERRE, QUI ONT ETE PUBLISES JUSQU’A PRESENT DANS LES DIFFERENTES LANGUES DE TOUTES LES NATIONS CONNUES. Paris: Chez Didot; , 1746-1770. • Les dix livres d’architecture de Vitruve, Vitruvius Pollio, Marcus. Edited and translated by Claude Perrault. Paris: Jean Baptiste Coignard, 1684. Engraved frontispiece, 65 plates and numberous small engravings. • Histoire Des Plantes, Garidel, Pierre Joseph (1658-1737). HISTOIRE DES PLANTES QUI NAISSENT AUX ENVIRONS D’AIX et dans plusieurs autres endroits de la Provence. Aix: Joseph David, 1715. • Sketches of a Tour, Cuming, F[ortescue]. SKETCHES OF A TOUR TO THE WESTERN COUNTRY, THROUGH THE STATES OF OHIO AND KENTUCKY, ETC. ; Pittsburgh: Cramer, Spear & Eichbaum, 1810. • Ferrario’s Il Costume Antico e Moderno, Asia, Ferrario, Dottore Giulio. IL COSTUME ANTICO E MODERNO O STORIA: Parte I: ASIA (vols I, II, III, IV), Milan: Della Tipografia Dell’Editore, 1815-1818 Set numbered 72 and 71. Other volumes in the series – for Africa, Europe and America – will also come up for bid. The impact Millicent Rogers had on fashion and high society can’t be overstated. She is still credited today as an influence on major fashion designers. When she burst on the scene in the 1920s as a beautiful young socialite, photographs of her were regularly featured in Vogue and Harper’s Bazaar. Gossip columns in major New York City papers followed her every move. Ms. Rogers’ look and style were the inspiration for the Barbie doll in the 1950s. Photos of the first-generation Barbies, when placed alongside ones of Ms. Rogers, show that the two are strikingly similar. Her costume collection donated at the time of her death in 1953 was the foundation and beginnings of The Met’s Costume Institute. Sadly, Ms. Rogers was just 51 years old when she died, having battled health issues her entire life, including rheumatic fever as a child, multiple heart attacks, double pneumonia and a mostly crippled left arm. For more information about the Feb. 22-23 auction of items from Turtle Walk, the Taos, New Mexico home of Millicent Rogers, or to learn more about Charlton Hall Auctions, please visit www.charltonhallauctions.com.